My ability to do any kind of yard work has been terribly curtailed since 2011. First, it was my knee. Then it was the general diagnosis of rheumatoid arthritis and the whole getting used to what I can and can't do part. Oh I've done some, and felt like the king of the world when I've accomplished it, but as much as I like that sense of accomplishment, my ability has not kept pace with my wanting to get things done. 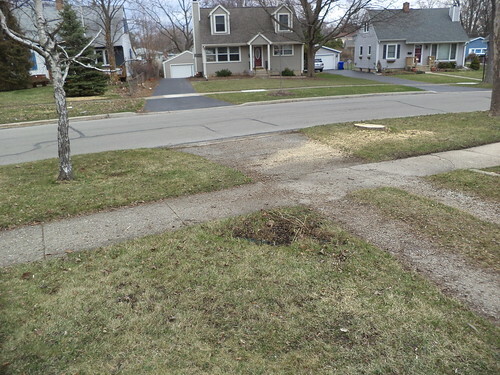 Back in February, the city took down the dead ash at the corner of my lot with my neighbor's. I realize it was snowy, but they made such a mess. 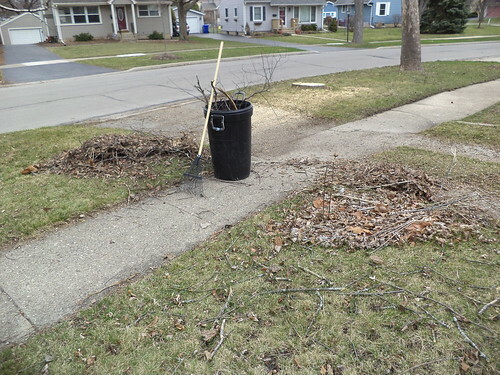 Sticks and branches everywhere and there was just no effort made to corral things and make them neater. 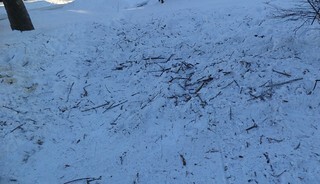 I have driven by 4 other places where ash trees were taken down and they were all handled much cleaner than this was. The conspiracy part of me thinks that because those trees were on more well traveled roads and this was on a side street, it was, "Just take 'er down, boys. Don't worry about the mess." But it poses a problem for mowing the lawn. I could ask the guy who mows my lawn to perform clean up, but that's not what he prefers to do, so either I hire a firm or do it myself. I opted to do it myself. It took an hour to get to this point. The wind was quite strong on Saturday and my small piles tended to be blown about. I left the front door open and the girls came out sporadically, to see what this side of the house was like. They would bolt back inside when a car passed by on the street. Eventually, they decided being inside was better than being out. They never left the front steps, which is a very good thing. After an hour and a half of work, the front looks very nice. That corner is where the few prairie plants are that I have. I raked it clear and I think about enlarging the area and adding more plants. That dead birch tree needs to be taken down. It really could be done with neighbors as it's not very big. 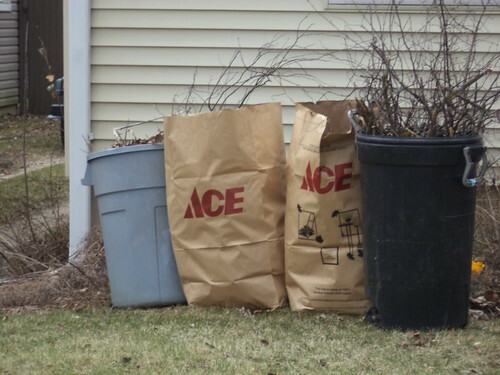 I have a few bags of branches and leaves to be tagged and put out on Wednesday. 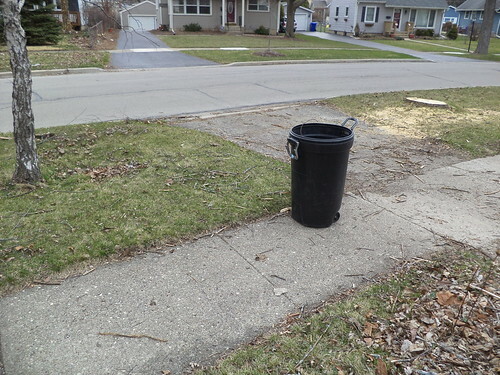 The windy rainy weather of the past few days has toppled one can and one bag. I left them in front of the house. I'm not dragging them to the back only to drag them back to the front on Wednesday. I'll decide, if I'm tired, that it's too much work and they will sit in the back. I know me. So, this way, I have to take them to the curb. When this was done, I decided to sweep the front steps. 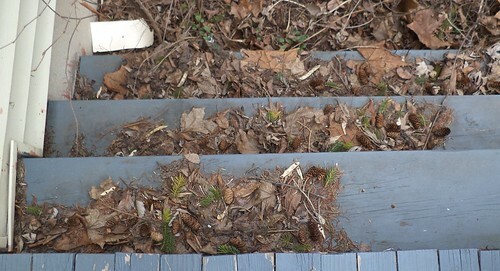 The winter of our discontent left a lot of debris on the steps. I don't shovel off the side steps. I just do the front so anything on the sides stays there all winter. It took some sweeping but the steps were cleared. I'm going to ask my neighbor, Zeke, to power wash my deck and it appears the front steps could benefit from a wash. 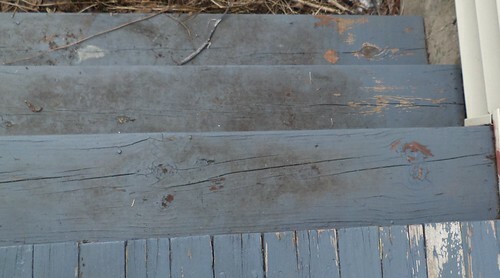 I know I need to restain the deck; it's on my list of things to do this summer; and I have to repaint the top part of the steps. I may have to, once they are washed, repaint the steps too. Oh well, that might actually use up the paint I bought some 2 years ago. When all this was done, I plopped down in the recliner and fell asleep. It was a good 2 hours of working outside in a mild day. I accomplished a lot and it makes me feel I can do more, if bitten off in small 2 hour chunks. I like how the yard looks now which is the whole point of this.